Distribution of Operation Christmas Child shoeboxes is always met with smiles. You can pick up, fill, and drop off shoeboxes this week. Filled shoeboxes can be dropped off at Celebration Ford or at Moosomin Baptist Church. Organizers are hoping to collect more than their total of 880 shoeboxes that were collected in Moosomin last year. 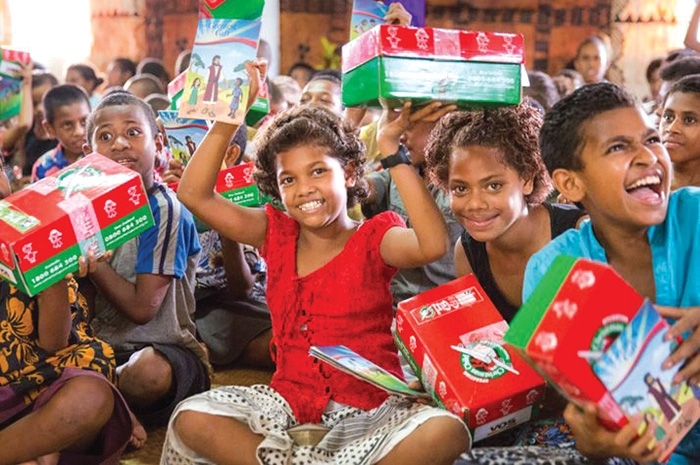 This is the week to return your shoebox for Operation Christmas Child. If you haven’t picked up a shoebox to fill for needy children, there’s still time to pick up a box, fill it with items and return it to be shipped on to needy children in developing countries. Tyler Thorn of Celebration Ford said the dealership became involved four years ago to try to make a difference. “It started about four years ago. Gloria and I wanted to do a shoebox, and we saw a video showing them distributing the shoeboxes to those kids. It was really, really emotional. “Our kids here get spoiled every day. Those kids get a shoebox full of gifts once in their lifetime and in the video you could see how excited they were. “We thought that’s something we should do, we thought we could do our part to try to help when we realized what a difference it makes. How can you not want to be part of something like that? “We filled a shoebox that first year and talked to Rolna who was in charge of it then, and asked how else we could help, and we ended up handing out and collecting the boxes. People can pick up shoeboxes at Celebration Ford, fill them and drop them off by the end of the week. Nicky Van Deventer is organizing the local drive for Operation Christmas Child this year. She is hoping to collect more than the 880 boxes that were shipped from Moosomin last year. Moosomin is the collection centre for the surrounding area, and many churches in surrounding communities put together a lot of shoeboxes. “Talking to the organizers in Winnipeg, I’m told that for such a small town, we bring in more than some of the major places,” Van Deventer said. “Moosomin and all these small towns are extremely giving. If there is someone in need or they know it’s going to a good cause, they will be there to help out. If someone really needs it, poeople will really try to help. Boxes are usually filled with a toy, art materials, books, socks, toothbrushes, and hair items for girls. Each box can be packed for a girl or a boy, by age category: 2-4, 5-9, or 10-14. Those who contribute the boxes are usually very happy to help, she said. Why is the program so popular in the Moosomin area? “We have so many different people who help out,” says Van Deventer. “Some of the older people actually knit socks to go in the boxes. We have older people, we have young families, and everyone seems very happy to be part of it. “I think personally people here have very open and giving hearts,” said Deventer. Deventer said she is happy people are so willing to help with the project. Why did Deventer volunteer to be part of the project? “It’s for kids, and I have a heart for kids. Everything that I do in the church or the community is always with kids. “This makes a very big difference in a kid’s life—receiving a shoe box and sharing God with them. It is not just the shoebox—as soon as they receive that they have weekly little sessions for the kids that they can go to. They are exposed to something they wouldn’t have otherwise. Shoeboxes can be dropped off at Celebration Ford during regular business hours this week and at Moosomin Baptist Church each weekday this week from 9 am-12 pm and 1-3 pm, and Saturday 10 am-5 pm.